Hurricane Joaquin continues to bring its wrath to the central Bahamas, intensifying into the first Category 4 in the Bahamas in nearly 150 years…and continues to intensify!! Winds continue to be near 135 mph with recent satellite estimates as high as 150 mph. The Hurricane Hunters are currently on site in the Bahamas to witness a likely eyewall replacement cycle and hopefully some weakening. Joaquin continues to follow the flow around the decayed western Caribbean high pressure zone and probably some forward inertia down toward the southwest. As of 2315z/715pm ET, the shrinking eye of Joaquin was located between Long Island and Crooked Island in the central Bahamas with no signs of a turn toward the northwest as of yet. This deeper path through the Bahamas has really done a number on Crooked Island and Semana Island (uninhabited) this Thursday. Hurricane force winds and winds of 110 mph plus have been recorded on the western tip of Crooked Island and according to this rainfall map more than a foot of rainfall has also fallen there. This rainfall in combination with the 5-8 feet of storms surge and additional wave probably is inundating most of Crooked Island, although this is unconfirmed. Note that this rainfall map only continues through the early afternoon and does not include this evening when Joaquin got its closest. Prepared to hear the worst from this island so far. According to Wikipedia/census data, that island is inhabited by 600 people. Earlier radio reports from the Bahamas reported that shelters may have not been available on the island. My prayers go out to all those in the central Bahamas. Background graphic from Tropical Tidbits. Annotated with double wind maximum. 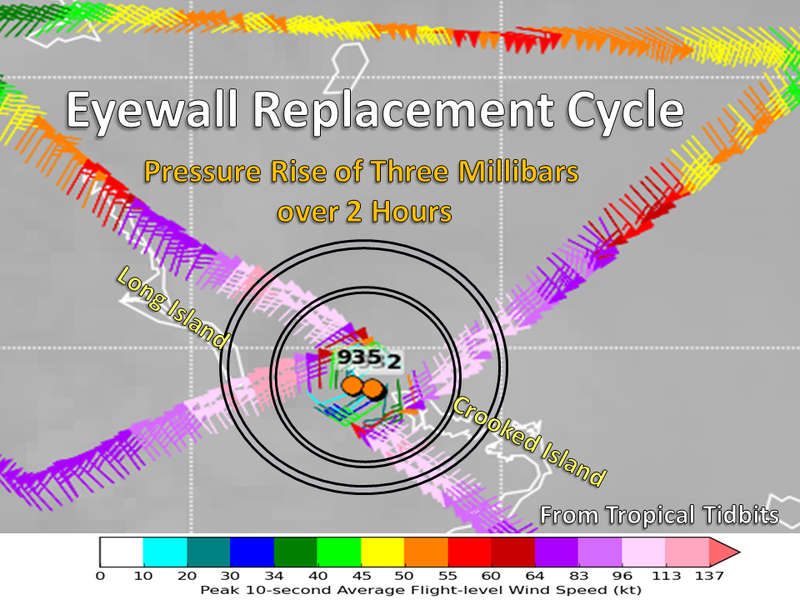 An eyewall replacement cycle is likely ongoing and starting at around 5pm ET or shortly after. Since that time the IR imagery has shown a shrinking eye and microwave imagery suggests that a new eyewall may have been building to the southeast. This has probably fed in counterclockwise around the old eyewall. Hurricane Hunters have found a double wind maxima. Pressure has also risen some. 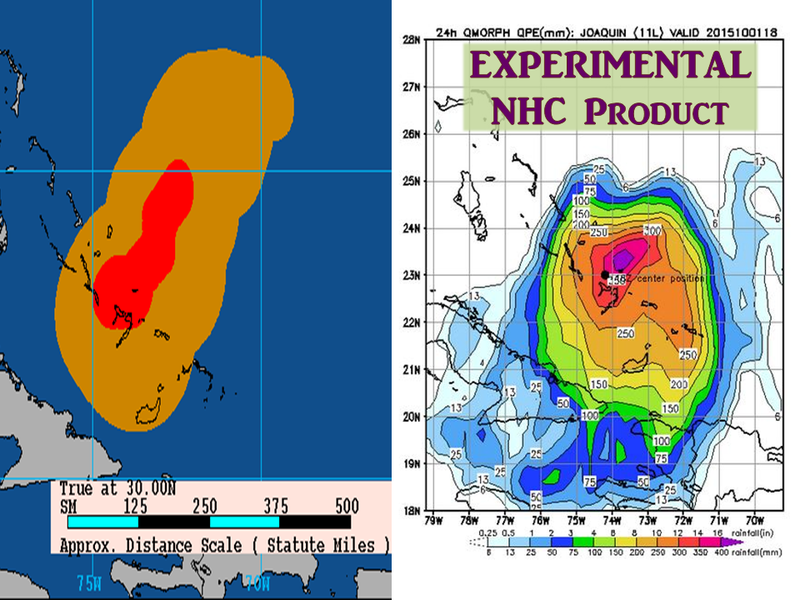 During the next 8-10 hours, fluctuations in intensity are likely and some (hopeful) weakening will take place. Joaquin will likely shoot the gap between Crooked Island and Long Island and probably reach 75W or so before turning toward the northwest during the very early hours of Friday. Due to Joaquin’s size and a recent wind gust at Guantanamo Bay of 55 mph, a tropical storm warning has been issued for parts of Cuba. Steering charts at various levels show that this turn is not far away and Joaquin should feel these effects west of Long Island. The bottom of the trough should continue to progress some eastward. This turn could bring the worst to Long Island and Exuma overnight and tomorrow. These islands are more populated. Rainfall over the last seven days in the Carolinas and Mid-Atlantic are already impressive, but still could be doubled as we move through the next five days. The rainfall below has absolutely no connection to Joaquin, and much of the rainfall over the next 5 days won’t have direct connections to Joaquin either. More than a foot has fallen in the last week, and coastal salt water inundation has occurred in Roanoke, VA, Miami, FL and Charleston, SC to name a few. Evacuation orders have been ordered for the barrier islands of North Carolina. Variants of flood watches have been posted for more than a half dozen states ahead of the next wave of rain. 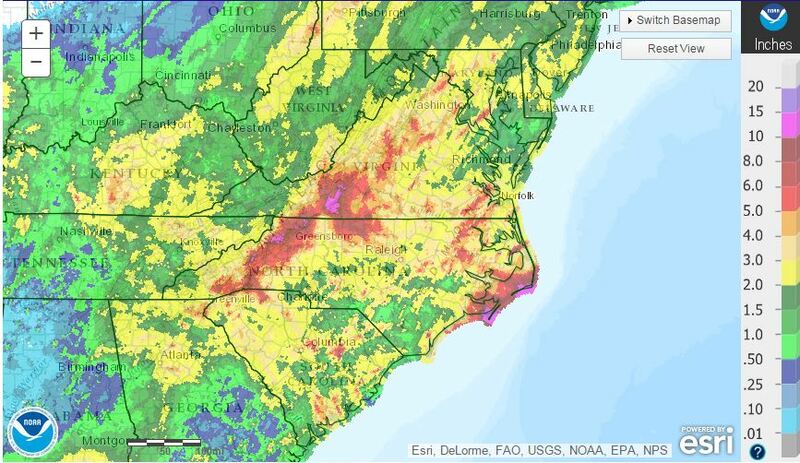 Thankfully there is a moderate drought in these areas of the Carolinas. Some fluctuation in intensity tonight and tomorrow are possible due to the eyewall replacement cycle. Some minor upwelling could occur, but since this systems continues to move, that seems unlikely. That being said this system should slow some as it turns. Some modest intensification is possible over the next couple of days as it begins to move over warmer and deeper waters (more heat for the cyclone to grow). 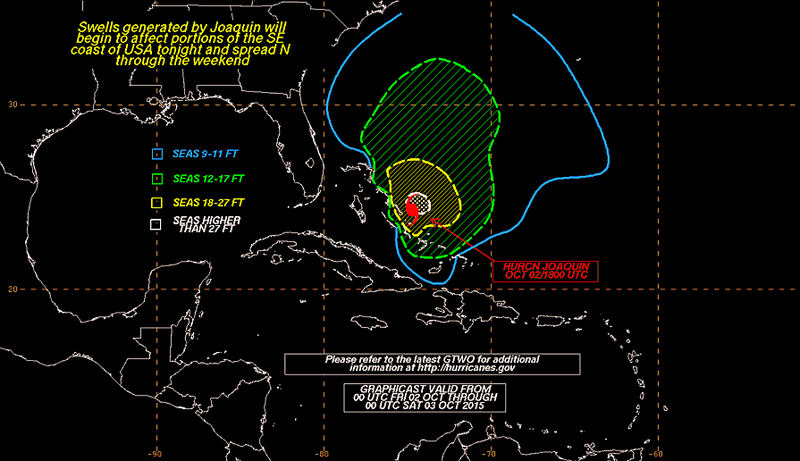 Hurricane Force winds will continue for the central and northeastern Bahamas tomorrow. Winds of 40 mph should slowly abate in the southeastern Bahamas/T&C, continue in the central and northern Bahamas and eastern Cuba tomorrow. The wind field could expand during the eyewall replacement cycle before tightening up sometime tomorrow. The probability of wind speeds greater than 40 mph are shown below for the next 36 hours, but may have to be shifted westward as the system continues to gain longitude. Some briefly drier air could impact the northeastern side of Joaquin tomorrow, but this also should have little to no impact on intensity, but it will have impacts on track with a weakness opening to the northeast associated with an upper level low. Even before Joaquin gets a chance to influence US weather, rain is already falling due to the same trough that is “protecting” us from the wind threat but not so much from the rain threat. 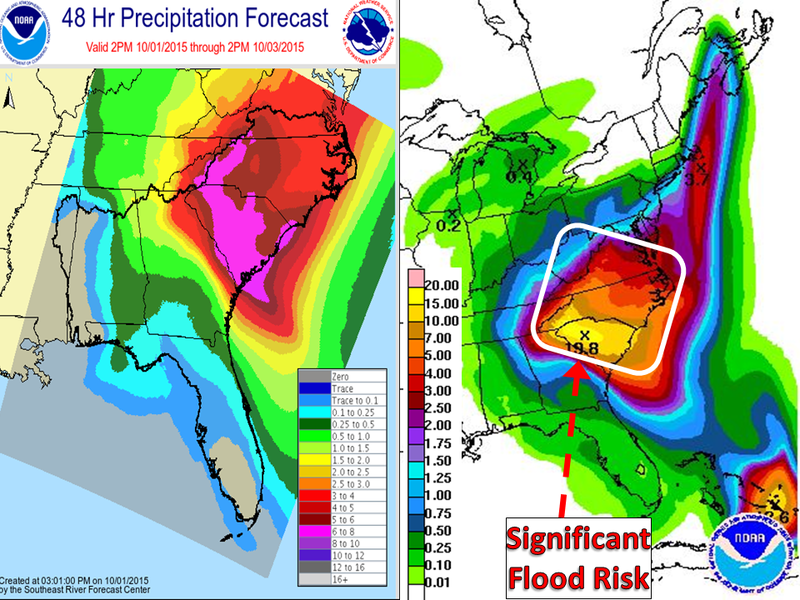 More than 3″ is possible in the low country of South Carolina just in the next 24 hours. Bahamas: Although the exact path that Joaquin will take will be dictated by exactly where and when the system begins to gain latitude again, impacts to the US may not change all that much. 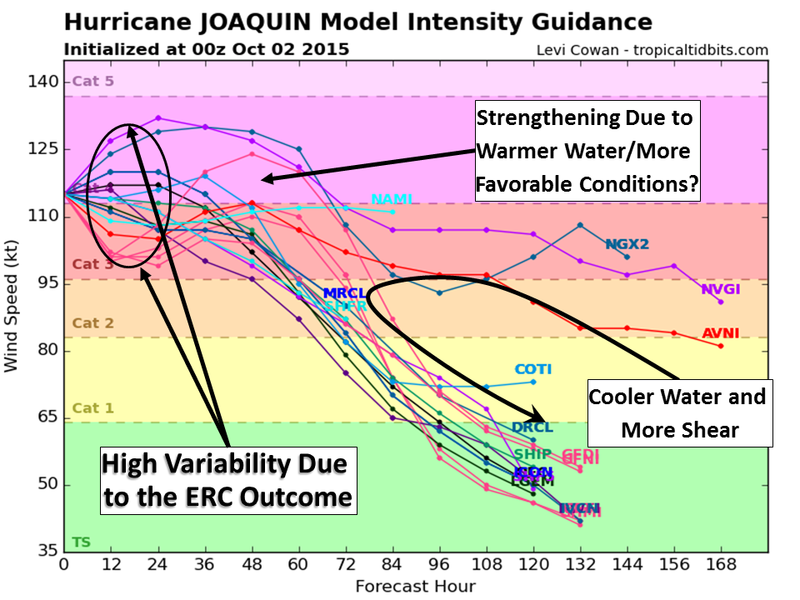 Joaquin will bring a very large pool of moisture to the north, and will enhance onshore flow ahead of its eye. Impacts to the Bahamas will continue through Saturday morning or perhaps the afternoon in the form of very high seas, heavy flood exacerbating rainfall, and winds greater than 40 mph. Tropical storm force winds should be leaving the Bahamas by 5 AM ET on Saturday. Rain should be dwindling by the afternoon hours on Saturday there. By then a foot to 18 inches of rainfall could fall in the central Bahamas with amounts totaling 2-4 inches in the extremities of the Bahamas including the Turks and Caicos Islands and a few inches of rainfall in Cuba mainly closer to the northeastern coast and along higher terrain. This rainfall is LIFE THREATENING especially on top of the rainfall already received. The seas near this system will be very high. Current NHC/TAFB forecasts bring waves of more than 40 feet to locations nearest the eyewall in the front right quadrant (rotates from NW to NE as the cyclone turns north) with very choppy seas expanding hundreds of miles to the north of this system. Higher seas yet will reach the US coastline tonight and tomorrow causing rip currents starting tonight along eastward and northward facing beaches. STAY OUT of the water on the US east coast this weekend. These waves, tides, and surges are life threatening. If you must go to the shore, be a bore and keep your butts on the sand! OVER THE WEEKEND AS WELL. 48 hour rainfall totals from the SE River Forecast Center and 5 day rainfall forecasts from the Weather Prediction Center. These amounts may come down only as much as 25% as the track of Hurricane Joaquin moves eastward…if it moves eastward. These rainfall totals may be orographically pronounced in the central and southern Appalachians this weekend. Extreme runoff and mudslides are possible if not probable. Any wind at all will bring trees and powerlines down. If the GFS, GFS Ensembles, and NAM are correct winds could temporarily reach 35+ mph in inland locations where the jet stream maximum sets up. These details will have to be narrowed in on over the next day or so. Although tonight’s model tracks have not responded to the continual SW to WSW motion of Joaquin, the general idea stands since last night that this hurricane should take off toward the NNE this weekend ahead of the tilted trough located in the southeastern US. 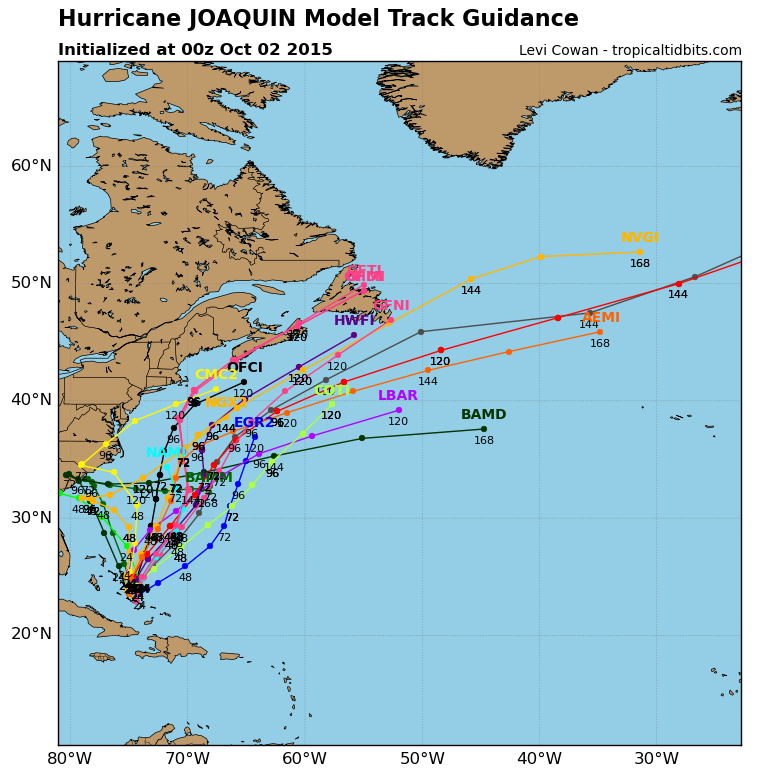 We’ll have to see how close Joaquin gets to the US and Canadian shores once it begins to turn. Additional upper air recon flights and balloon launches should help pinpoint the large scale pattern. There will be impacts to US shores in the form of higher seas and salt water inundation during high tides. For now, pay attention to the general ideas on the above models. Just yesterday, all of the models were over the US. Keep this in mind. Watch for trends. As I mentioned before, modest intensification is possible as Joaquin continues to observe very favorable conditions over the next 24-36 hours. 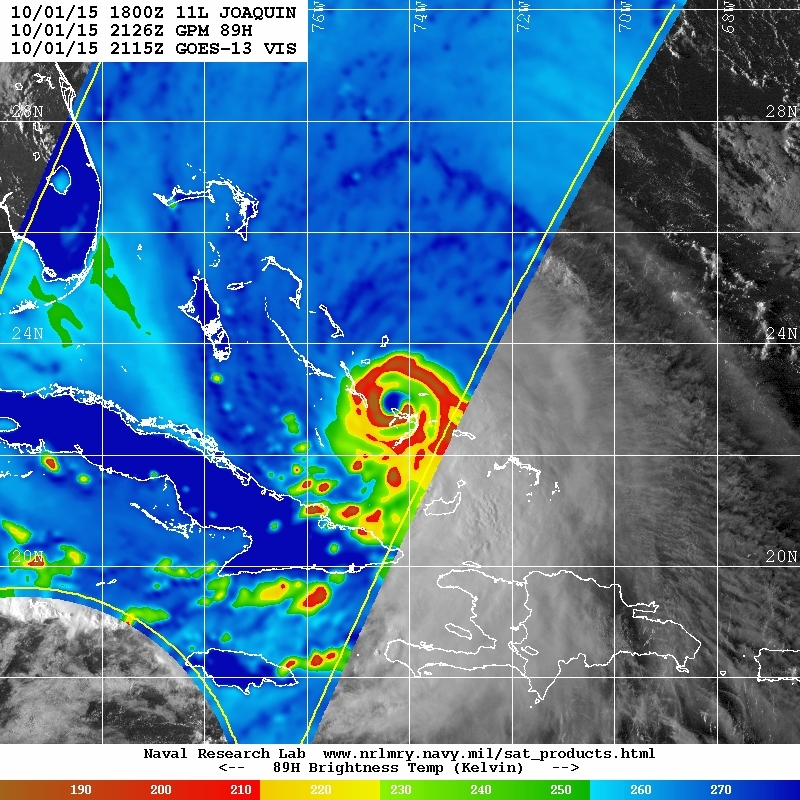 Some fluctuations in intensity are possible as the eyewall replacement cycle is completed. Warmer and deeper waters should allow for some intensification barring another ERC tomorrow as Joaquin pulls northward. This could last as long as 60 hours or until Sunday morning. Beyond that point, cooler waters will take over to weaken the system. The remnants of Ida and some additional moisture has reformed into a non-tropical area of low pressure well to the southeast of Bermuda. 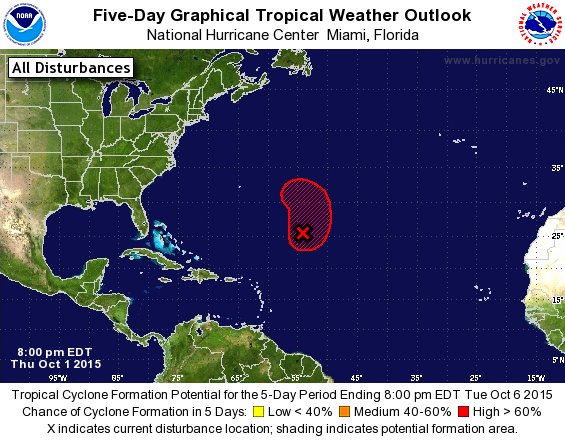 Chances are rising that this system could form into a tropical cyclone this weekend. Current chances of formation are 70% through Saturday night and 80% through 5 days. The Bahamas are in for an extremely rough evening and we could be in for a lot of damage in the next 24 hours with more damage coming in from excessive rainfall in the southeastern US and central Appalachians this weekend. Be VERY watchful and careful if you are in either of these locations. historic rainfall could come from both locations. Do NOT let your guard down as far as track goes until early next week. There are still a few moving parts that could change the forecast. PREPAREDNESS IS KEY. If you are not currently feeling the effects of Hurricane Joaquin, you should be preparing if you are in the aforementioned areas. Pay close attention to your local weather offices. Stay tuned and be safe! Posted on Thursday, October 1st, 2015, in Severe Weather, Tropical Weather. Bookmark the permalink. Leave a comment.